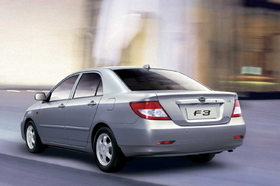 BYD's F3 compact sedan was China's best-selling car with Q1 sales exceeding 92,900 units. SHANGHAI -- BYD Auto Co. continues to forge ahead this year after achieving a 161 percent sales increase in 2009. By selling more than 163,500 cars in the first quarter, the company has surpassed Hyundai Motor Co. and Nissan Motor Co. to rank third by sales on the domestic sedan market, according to statistics released by the China Association of Automobile Manufacturers (CAAM). With its two joint ventures, Shanghai Volkswagen Automotive Co. and FAW-Volkswagen Automotive Co., selling a combined 394,700 units in the first three months, Volkswagen AG continues to top the sales list. General Motors Co. ranked second with sales of its Buick, Chevy and Cadillac-branded cars reaching 218,400 units. BYD's F3 compact sedan remains by far the best-selling car in China in the first quarter, with sales exceeding 92,900 units. It was followed by the Hyundai Elantra Yuedong with sales of 58,600 units, and the VW Lavida with sales of 58,300 units.